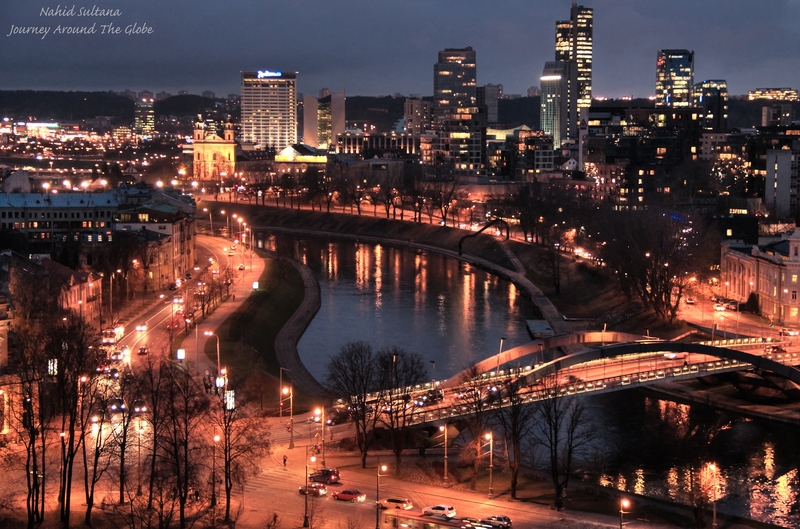 VILNIUS, LITHUANIA: Vilnius is the capital of Lithuania and definitely one of the most vibrant and unique cities of former Soviet Union. Historically, it was formed in 1236 by Lithuania’s first and last king, King Mindaugas. Lithuania has about less than 3 million people, among which mostly are Catholics. Their language roots back to Baltic tribes and interestingly very similar to Sanskrit. But locals speak very good English and most of the older generations speak Russian too. The years 1940 to 1941 reflect a very difficult and tragic period in the history of Lithuania. The country’s future was decided by other states when it was occupied in June of 1940 by the Soviets, and later annexed. Sovietisation and the brutal persecution of its citizens began. Over 30,000 people were persecuted under the first Soviet occupation (from June 1940 to June 1941). These persecutions and deportations of Lithuanians were only the beginning of the story of brutality and loss that lasted half a century. This experience is still alive in the memories of people of that generation, and to others through the stories of grandparents or parents. It has affected their fates and the fates of succeeding generations. Deportations, the mass evictions of people from their places of residence to the remotest regions of the Soviet Union, were one of the most brutal measures taken by the Soviet regime against civilians. Entire families, parents, grand-parents children, newborns, and the sick were secretly, usually in the dead of nights, carried away in cattle cars. The armed resistance by partisans between 1944 and 1953 took the lives of over 20,000 people. More than half of them perished fighting for freedom between 1944 and 1945. Most of the fighters who died were younger than 21. Even their deaths were brutally displayed in the public. In order to frighten civilians, the bodies of partisans were laid out in town squares, yards, and farmers’ markets. Vilnius reminded me little bit of St. Petersburg. 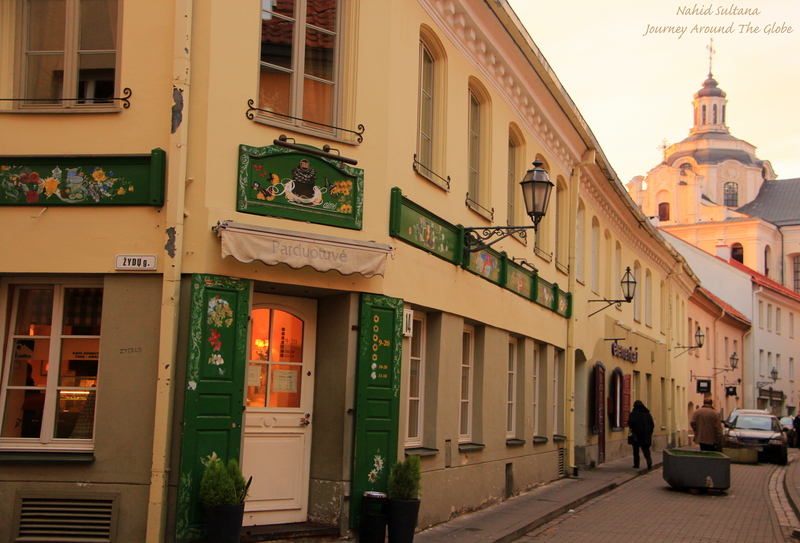 Old town of Vilnius is very nice and is enlisted as UNESCO World Heritage Site. Look for howling iron wolf in many places of Vilnius that depicts Gediminas’ (Grand Duke of Lithuania) prophetic dream. 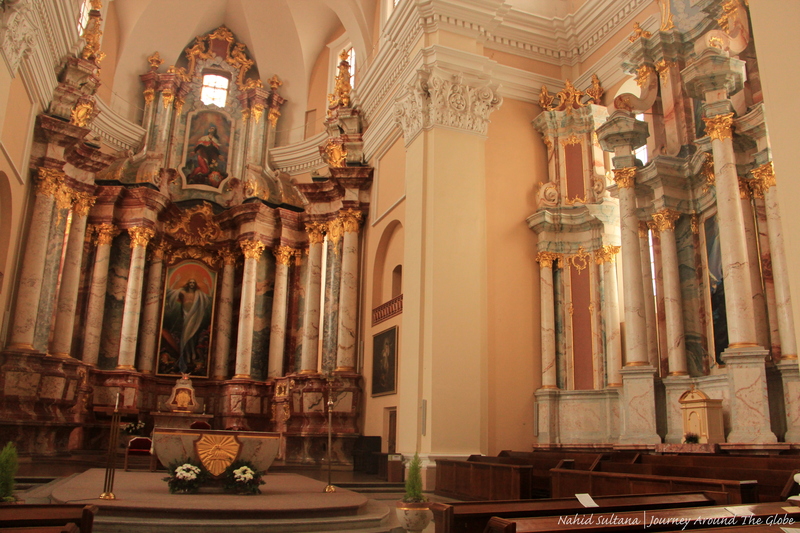 There at total of 52 churches in Vilnius, some…may be most of them date back to the medieval ages. But interestingly religious wise Lithuania was originally a pagan country and was the last country in Europe to accept Christianity. 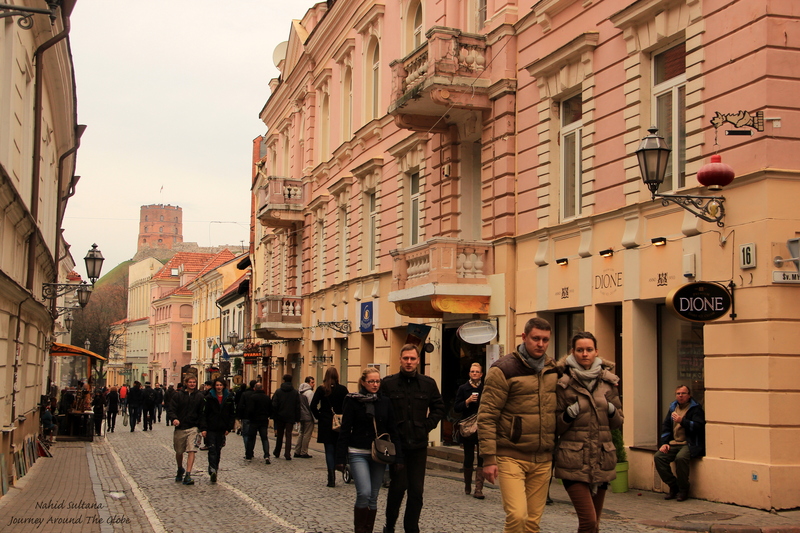 TIME of TRAVEL: It was the first week of November 2013 when we visited Vilnius. Eastern Europe can get really cold and chilly around this time of the year but we were very well prepared. The temperature was around early 40s during the day and mid 30s around the evening. We got a little bit of drizzle here and there but no major rain or snow. OUR HOTEL: We stayed in Atrium in the old town of Vilnius which was only a few steps from Cathedral Square and right in the middle of the shopping district. It was a gorgeous hotel with nice breakfast and free Wi-Fi in our room. The only thing I didn’t like about this hotel was that it didn’t have any elevator. The staffs were helpful giving us different options of making day-trips to nearby sites of Vilnius. Vilnius’s only Argentinean restaurant “El Gaucho Sano” is in this hotel where we had our last dinner…very fancy and truly good food. The location was also a plus point for this hotel, since we were within walking distance from all the main attractions of the city including St. Anne’s Church, Town Hall Square, and the overall old town pedestrian zone. The hotel is surrounded by many restaurants from fast food to authentic local Lithuanian kitchens. Also, many souvenirs shops and other boutique stores were very close by. 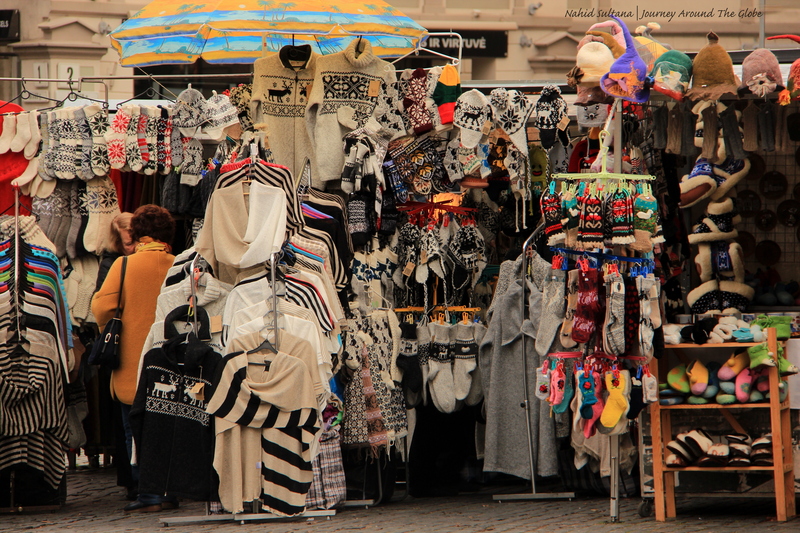 EATING and SHOPPING: Like Riga, Vilnius is an amber city too. There countless amber stores in the old town. Most of the decent stores will give you their authentication certificate with the jewelries or decors you buy. Many Russian influenced souvenirs are very common here, like Russian dolls, lacquered boxes. Many squares have local hand-craft vendors in the weekend. Our first dinner in Vilnius was in Forto Dvaras on Pillies Street, very close to Cathedral Square. Seemed like all the locals knew about this restaurant. It indeed offers some great local dishes with reasonable prices. We mostly tried some local Lithuanian dishes, like cheese dumplings, potato pancakes (Lithuanians eat lots and lots of potatoes). The building itself is a historic place with underground sitting arrangements. Cili Pica is a chain restaurant where we had 2 of our meals in Vilnius. You can find them almost in every neighborhood in old town. They have a nice combination of pasta, variety of pizzas, salads, soups, and some Lithuanian dishes. The price is very reasonable and the menu is very kids friendly. We also ate in Charlie’s Pizza on Pillies Street couple times. 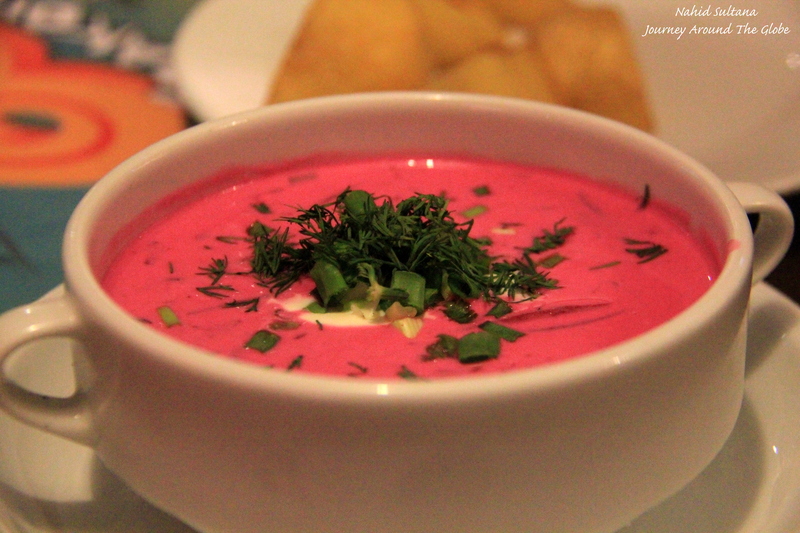 They mostly have lots of different types of pizzas, soups, salads, and some Lithuanian dishes. If you get a chance try their unique black breads…either in breakfast or with soup. 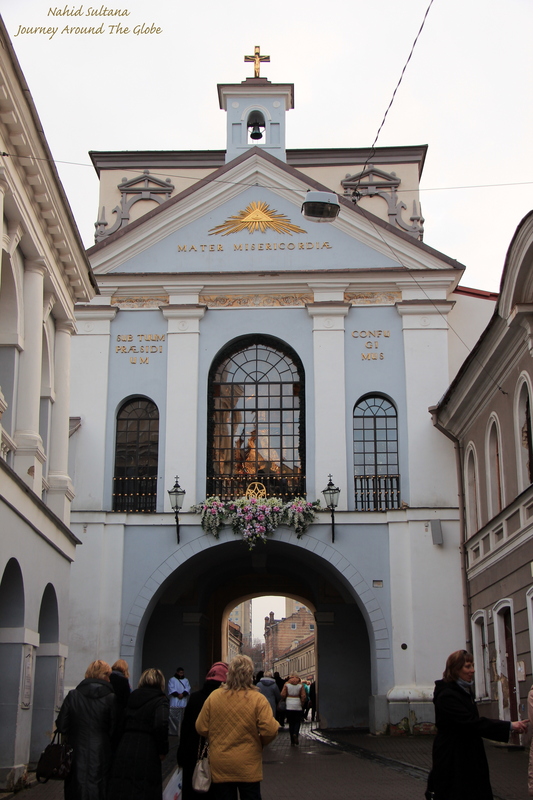 PLACES WE’E VISITED: We spent 2 full days in Vilnius and 1 day outside the city in Karnave and Trakai visiting the oldest capitals of the country. There are plenty of museums in Vilnius if they interest you. The old town of Vilnius is big, bigger than many other European cities we’ve visited, but everything can be cover on foot. 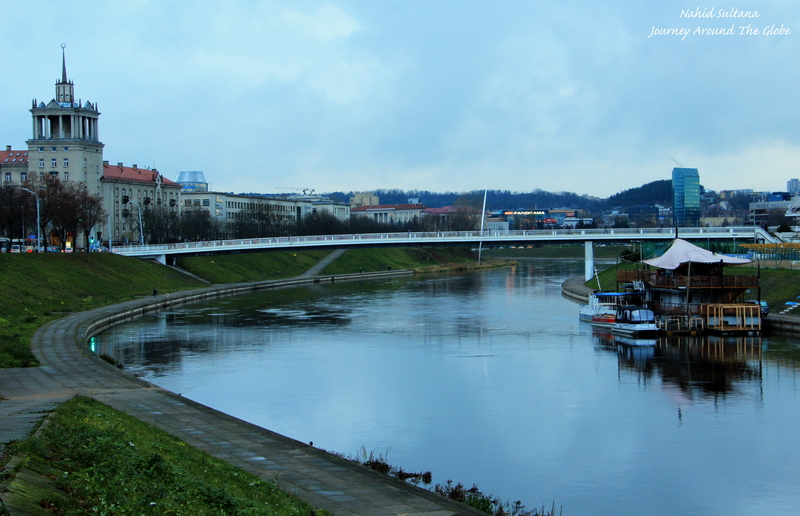 Notice the Green Bridge on River Neris which is the oldest bridge of Vilnius dating back to 1536. The Town Hall Square is a very lively place here which once used to be the main market square during the middle age. 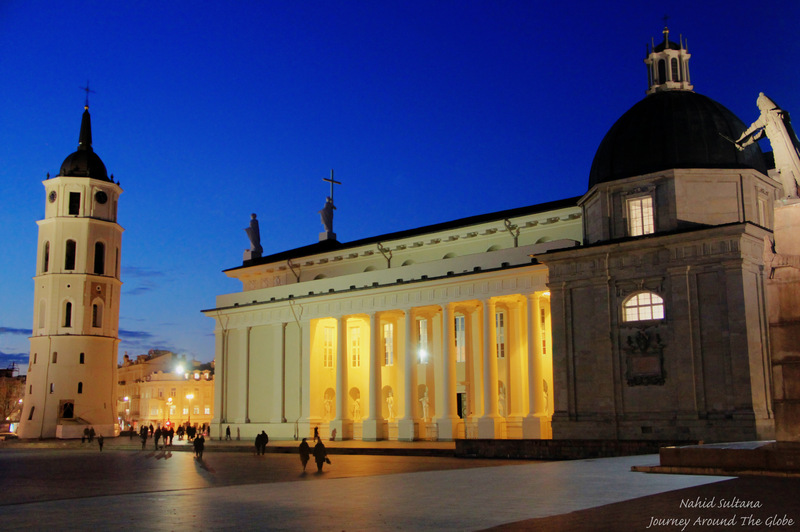 1) CATHEDRAL SQUARE and VILNIUS CATHEDRAL: Cathedral Square is a big place and a historic place of this country. Vilnius Cathedral is Lithuania’s most important sanctuary since its construction started in 1387. The cathedral changed its appearance many times with each new century. The present classical form of Gothic elements is from the 18th century. The exterior statues were added in the 19th century. Many biblical paintings are on display here, carvings on the ceiling are very beautiful too. The altar is simple with few columns. The most decorative part here is Baroque style St. Casimir’s Chapel (saint patron of Lithuania). His tomb along with other remains is kept here. This chapel is considered as one of the country’s national treasures. Although we didn’t go there, crypt beneath the church contains the remains of Lithuanian rulers and bishops. 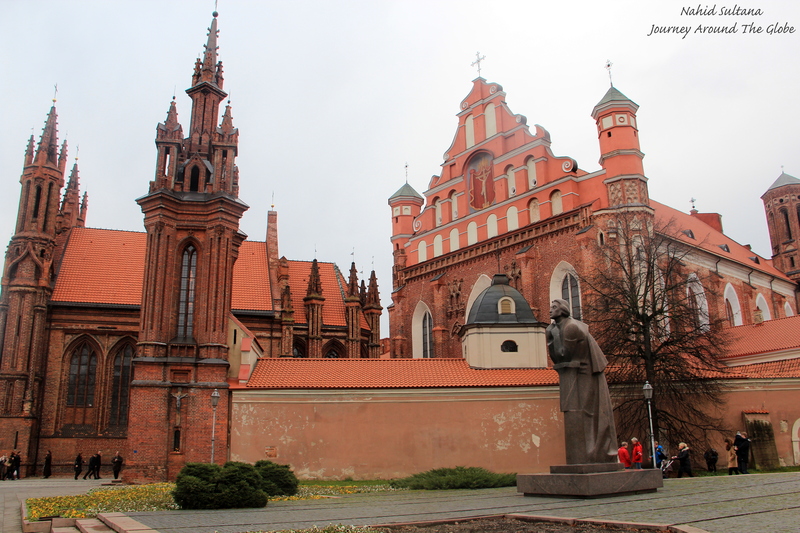 The 3 statues of St. Stanislaus, Helena, and Casimir on the roof supposedly represent Poland, Russia, and Lithuania. Belfry (57m) outside the church was built in 1522 on one of the 14th century towers of the Lower Castle. It is free to enter the cathedral and located at the bottom of Gediminas Castle. 2) KGB MUSEUM: Also known as Museum of Genocide Victims, KGB Museum is a unique and moving museum and a must-see in Vilnius, even if you are not the museum type person. This is one of a kind place in the Baltic region. The museum is set up in the former KBG headquarters and prisons where Soviet crimes were planned and committed in the course of 50 years. Nazi Gestapo and the KGB occupied this building at different times of the 20th century. Genocide of the population was planned here. Citizens of Lithuania were imprisoned, interrogated, tortured, and killed here in a mass level. 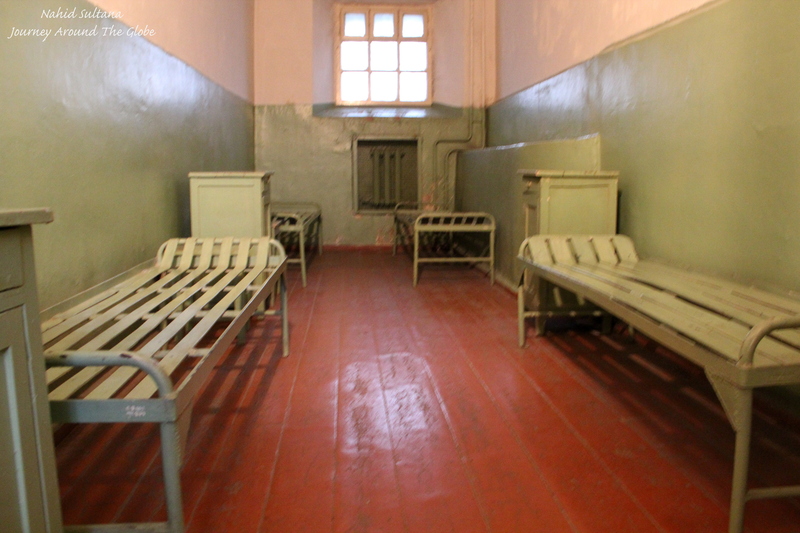 Visitors can learn about the most tragic period in Lithuanian history in exhibitions in prison cells, the execution cell, and the rooms of the KGB officers. The exhibitions deal with the painful and dramatic times of this country including the loss of independence, brutal reprisals at the hands of the Soviet regime, and the bitter fight for the reestablishment of independence. The museum is housed in a 19th century neo-Classical mansion previously used as a court building. The main façade with a front entrance faces Gediminas Avenue. Throughout the Soviet era (1940 to 1941 and 1945 to 1991) the building was occupied by the Soviet repressive institutions such as the NKVD-NKGB-MGB-KGB while during the period 1941 to 1944, the Nazi Gestapo reigned in the building. Out of this building came the evil thoughts for the extermination of residents and persecution of many people. The bottom bricks on the exterior of this museum have the names of those who were believed to be executed inside this building. The basement of the building served as a prison for the Nazis while the Soviets used it as a prison with an execution chamber inside. From autumn 1942, the building houses the Special Squad of the German Security Police and SD which carried out mass massacres in the forest of Paneriai (just outside of Vilnius) of Jews, communists, Soviet activists and members of the resistance movement. The stones outside the building bear the names of the freedom fighters killed from 1944 to 1947. Other than the museum, the building also houses Genocide and Resistance Research Centre of Lithuania and the Lithuanian Special Archives where the former KGB archive documents are stored. The main part of the exposition is on the top floor which houses material about anti-Soviet and anti-Nazi resistance and information about the participants in the fights for freedom and genocide victims. Here, visitors can see furniture from the 40s, things used by NKGB-MGB officers, the inventory of the desk, and the interiors details are shown here, with materials from the period 1939 to 1941. Also the pictures and stories of civilians who were deported from their homelands to the remotest areas of Soviet Union are in display here. The documentary materials displayed acquaints visitors with the procedures of organizing and carrying out deportations, the legal status and living conditions of the deportees, and statistical documents about the deportations. Documentary and feature films, and photographs of burial grounds in Siberia, supplement the factual information, and show the fate and misery of the people who suffered humiliation and injustice. It is situated in the very heart of Vilnius about less than a mile from Cathedral Square, took us about 20 minutes to walk there. The museum is open Wednesday to Saturday from 10 – 6, Sunday from 10 – 5, and closed on Mondays and Tuesdays. Ticket is 6 LTL per person, 8 LTL if you want to include an audio guide, and 5 LTL for camera pass. 3) GEDIMINAS CASTLE and TOWER: Also known as Upper Castle, this castle is considered as a symbol of Vilnius. The castle and its tower are located on the 48-meter high hill and were named after the city’s founder Gediminas, the Grand Duke of Lithuania. Built at the beginning of the 14th century, and replacing an earlier wooden one, it withstood the attacks of the Crusaders. At the beginning of the 15th century, it was rebuilt strengthened, and along with the Lower Castle, composed a powerful defensive complex. After damage caused by the war with Moscow in 1655, the castle lost its importance and was not rebuilt. 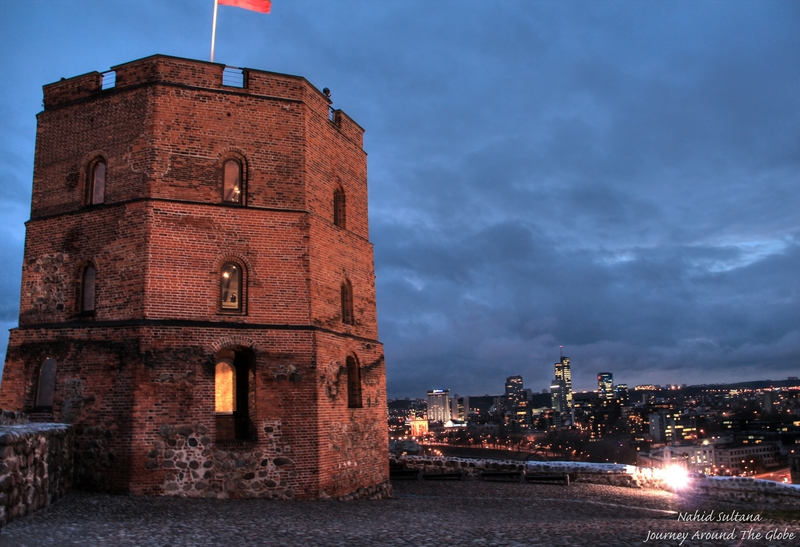 After WWII, the best surviving tower in the upper castle, Gediminas Tower, was restored and now houses a museum and an observation platform that offers visitors an impressive panoramic view. Gediminas Castle offers best view of Vilnius. We went there after dark and enjoyed stunning views of old town and new town. Also River Neris and bridges on it look fantastic from here. We didn’t go inside the museum or tower as it was closed by then. Funicular to the castle is open in May – September from 10 to7 daily and October – April from 10 to 5 daily. You can also walk up the castle from either Cathedral Square or by the river Vilnia. Ticket price is 3 LTL for round trip and 2 LTL for one way ticket. The castle hill opens at 7am and is visitors can stay there until 9pm. 4) THE GATE of DAWN: The Gates of Dawn, the only one of ten original defense wall gates remaining, was built in 1514. After the reconstruction of 1829 the Chapel acquired the features of late Classicism. The Chapel in the Gates of Dawn houses a gold image of The Blessed Virgin Mary, Mother of Mercy, which was placed above the gate to protect the city. The chapel is very small but beautiful, it can get crowded since many worshippers go there to for prayers. Free to enter and is located very close to city’s town hall. 5) CHURCH of ST. PETER and PAUL: This is considered as the pearl of Lithuanian Baroque and the most splendid example of the style. Exterior of this church was built around 1668 – 1674, and the interior took another 30 years. The interior of the church is famous for its exceptional baroque sculpture works where one can see about 2,000 stucco moldings representing miscellaneous religious and mythological scenes. The founder of the church Grand hetman M. K. Pacas was an Italian noble man who settled in Lithuania and wanted to build his own church. The coat of arms of the Pacas family can be seen above the entrance. Two Italian architects created a harmonious synthesis of architecture, sculpture, and art: about 2000 figures are arranged according to the principle of the world as a theater. Behind the altar is a picture of Saints Peter and Paul by the famous artists P. Smuglevicius. Many war memorial/depiction can be seen since it was built after a war. Look up to the elegantly decorated and detailed carved dome and some 17th century frescoes on the walls. Painting in the altar depicts Peter and Paul saying goodbye to each other with 4 evangelists: Luke, Mathew, Mark, and John. 6) HILL of THREE CROSSES: 165 meters above sea level, this hill is one of the symbols of the importance of Christianity in Lithuania and Lithuania’s mourning and hope. Three white crosses were erected to commemorate 7 Polish Franciscan monks, who, according to a legend, came as missionaries and were tortured and martyred by pagans on this site and were thrown in River Vilnia. The first wooden crosses of Holy Trinity were built in 1613, and later renovated, but removed by the Russian administration after the revolt of 1863. A concrete monument was built in 1916. 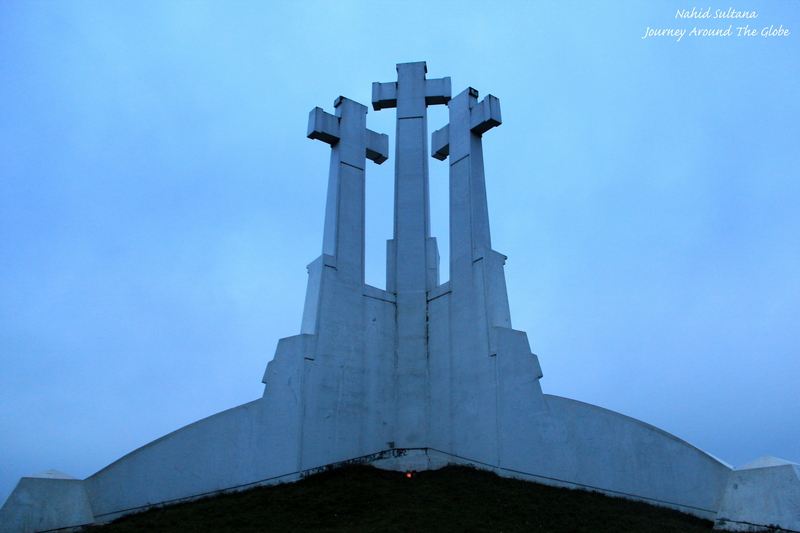 The Soviet authorities destroyed the crosses with explosives in 1950, but after it was rebuilt in 1988 they have been standing in their original place, imprinted in the silhouette of Vilnius as symbols of Christianity of Lithuania. An excellent view of old town is also to be found at this spot. You can also see Gediminas Castle along with a beautiful panoramic view of the old town from up here. The entrance is free. 7) PRESIDENTIAL PALACE: This is the official residence of the President of Lithuania. This building is in the central part of the former Governor’s Palace. The first palace here was built in the 15th century and was used as the Vilnius bishops’ residence until the last division of the Polish-Lithuanian state in 1795. In the 19th century it was visited by many distinguished personalities, such as Napoleon Bonaparte and M. Kutuzov. Now it’s an Empire style building having impressive and decorated colonnades on the both sides of the palace. Although we didn’t go inside since it was already end of the day, the interiors are supposed to be very beautiful. The president’s office is the on the right side of the palace. 8) VILNIUS UNIVERSITY: The University was established in 1579 representing different architectural styles: Gothic, Renaissance, Baroque, and Classicism. It consists of 13 enclosed courtyards. St. Johns Church (14th – 18th century) and the highest viewing point of the old town – 68 meters high campanile. This is one of the oldest and biggest universities in Easter Europe. The university has the oldest library of the country. Visitors have to pay 5 LTL to go to the front courtyard. 9) ST. ANNE’S CHURCH: This church was built at the turn of the 15th-16th century and is the most fascinating and prominent late Gothic building in Lithuania. This is one of the oldest churches in Vilnius. It was built from 33 types of simple clay bricks. It is a small church but so beautiful that Napoleon wanted to take it on his palm and bring it to Paris. There is a statue of a famous Polish poet (Adam Mickiewicz) beside the church who was a student and then teacher at Vilnius University. There is no entrance fee and it’s located before entering Uzupis District. 10) AMBER MUSEUMS and GALLERY: The museum and gallery were established in a Baroque style house of the 17th century. The cellar keeps a valuable archeological finding: well-preserved kilns dating back of the end of the 15th-16th century. Museum houses exhibition about history of amber origin, differences in form, size, and color. 11) UZUPIS DISTRICT or UZUPIS REPUBLIC: Uzupis is a unique state within a state by River Vilnia in the old town – it has its own president, anthem, constitution, flag, and guardian – the bronze Uzupis Angel (look for the big statue of an angel standing over an egg and blowing trumpet). 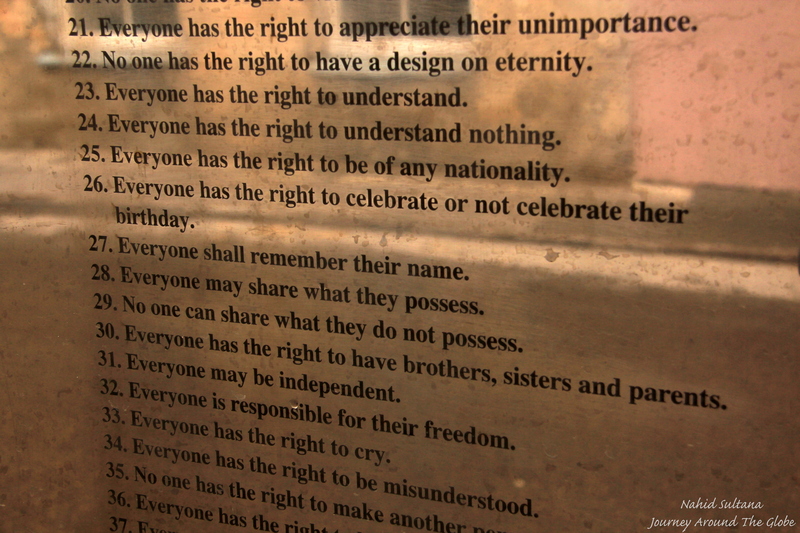 The constitution of the Republic of Uzupis is available in many languages for public viewing at the beginning of Paupio Street. We’ve heard that on the April Fools’ Day mock border polices actually stamp tourists’ passports for fun. Historically this place used to be occupied by artists, painters, and…poors. Now city’s mayor lives in Uzupis District and many other rich families. This is a hub for many art galleries. 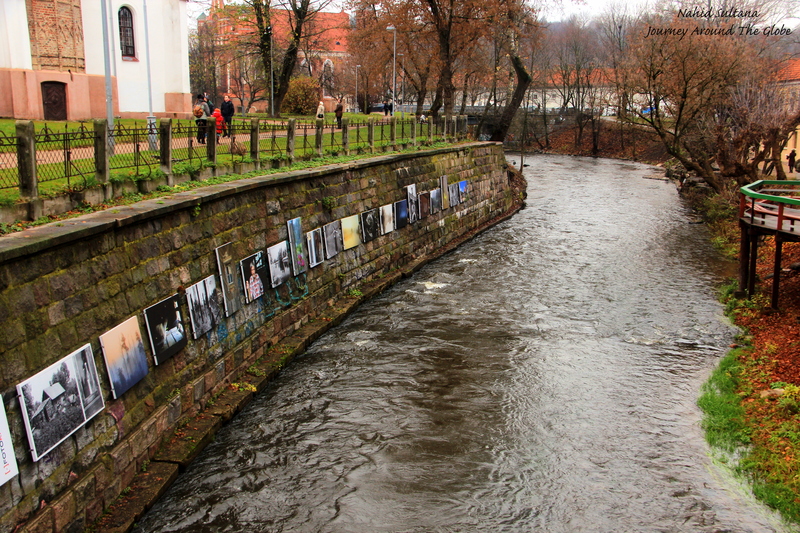 Walk by the river to see some sculptures and creative art works on the street. Overall, this is a very nice place. 12) ST. FRANCIS OF ASSISI CHURCH (BERNARDINE CHURCH): This Roman Catholic Church was built at the end of the 15th century and is one of the largest sacred Gothic buildings in the country. The church is said to have the oldest crucifix in the country from the 15th century. Brick exterior and wooden interior of this church is small but worth visiting. There was a service going on when we went there, could only peeked from outside the glass door. Bernardine Church is located right behind St. Anne. Church is open from until 7pm every day and there free to enter. 13) LITERATU STREET: It is thought that this street was named “Literatu” only at the second half of 19th century in the honor of the poet Adam Mickiewicz who lived here. 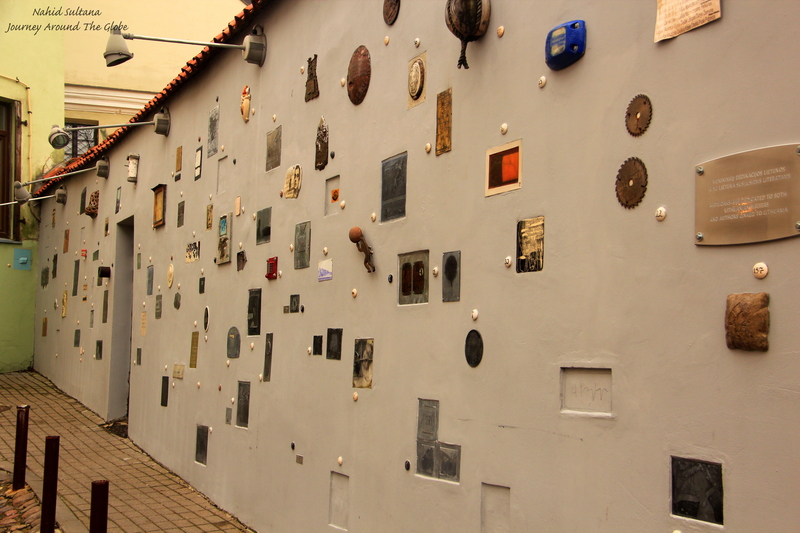 This is a small stretch of street with many artistic objects mounted on the wall mainly created between 2010 and 2012. This wall was solemnly opened in the street where painters and other field artists created outdoor proof techniques like plates or small objects made of ceramics, sculptures, metal, wood, glass, etc, in the color of litterateurs. 14) RUSSIAN ORTHODOX CHURCH of ST. NICHOLAS: In 1514 a Gothic church with elements of the Byzantine style was erected on top of another old church that was burnt down previously. During it reconstruction after the fire of 1748, its architecture was changed: the pediment, the facades, and the heightened tower became Baroque. In the 19th century the church acquired its present Byzantine appearance. The chapel inside contains a mosaic of St. Michael the Archangel, created at the Art Academy in St. Petersburg. Despite the reconstructions, the building has preserved many authentic Gothic elements and some valuable pieces of Byzantine art. It’s located very close to Town Hall. Inside and outside of this church are both beautiful. It’s small but has a gorgeous altar inside and many golden crosses outside on its domes. 15) ST. CASIMIR (JESUIT) CHURCH: St. Casimir is the patron saint of Lithuania. 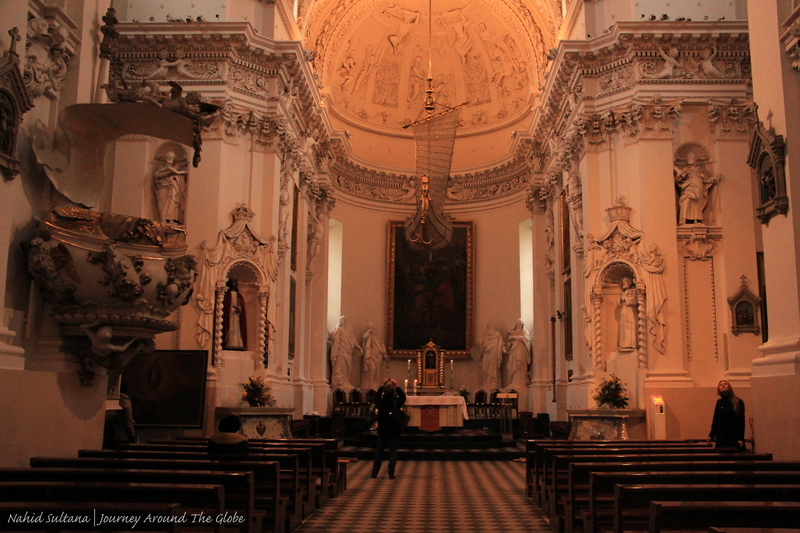 This is the first and one of the finest Baroque churches in Vilnius built by the Jesuits. The cornerstone, dragged by some 700 people, was laid in 1604. The building suffered a great deal from wars and fires. In the 18th century, the collapsed dome was replaced by a new one with a crown, and the interior was decorated with 13 Late Baroque altars, most of which were destroyed by Napoleon’s army. In 1868 it was adapted for the Russian Orthodox Church: the towers were lowered and topped with onion-shaped helmets, and the Baroque frescoes and sculptures were demolished. After WWII the church was turned into the Museum of Atheism and in 1991 returned to the Jesuits. The majestic cupola of 40 meters rises where the central nave and transept meet. 17 meters in diameter, it is topped on the outside by the crown of the grand duke of Lithuania. It’s elegantly decorated red and white altar with marble columns and high dome make it a really beautiful church to visit. The church is open on weekdays from 4:30-6:30 and on Sundays from 8:30 to 2pm. It is free to enter and located near Town Hall. “The Vilnius Ghetto was established on 6 September 1941 on the initiative of Vilnius City Commissioner Hans Hingst. Up to the end of October 1941, there were two ghettos in Vilnius – Large (about 30,000 prisoners) and Small (9000 – 11000 prisoners). 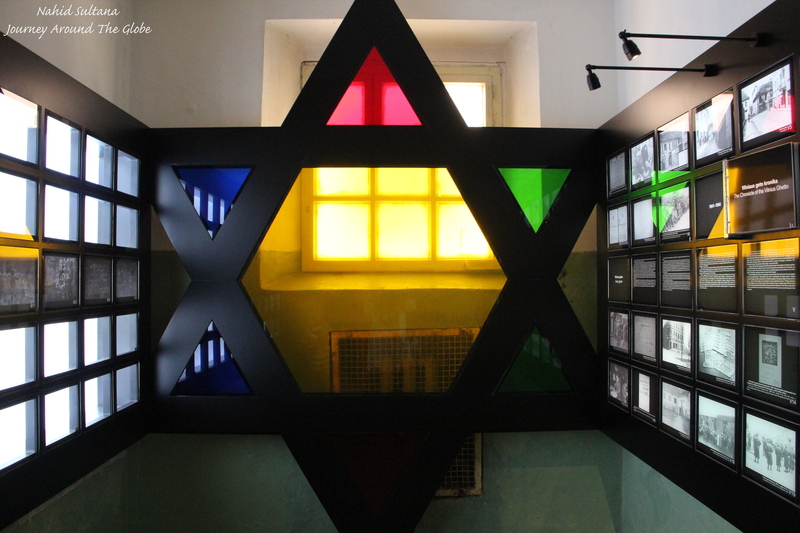 Most of the Jews imprisoned in the Large Ghetto were qualified specialists and skilled workers, while the Small Ghetto was the ghetto of the incapacitated (the elderly, frail, and sick). By the end of 1941, German and Lithuanian police units and SD special squad had killed about 30,000 Vilnius Jews in Paneriai Forest, located outside the city. During the mass killing actions, all the residents of the Small Ghetto were killed and this ghetto ceased to exist. We entered the former ghetto from Stikllu Gatve from the Town Hall Square. There is nothing much to do or see here except for going back in time and try to feel the situation of the victims here from 1941 1944. There are some beautifully designed buildings, high-class hotels, exquisite shops, and cafés here. The whole neighborhood is very calm and quiet.